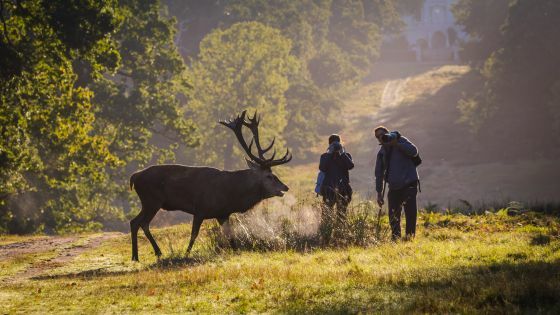 Photographers and selfie-takers, desperate to get the perfect shot of wild deer in battle, are being urged by The Royal Parks charity to keep their distance during rutting season. The annual rut which takes place in Bushy and Richmond Parks between September and November, sees red stags and fallow bucks compete for females. The male deer, pumped full of testosterone, roar, bark and clash antlers to fight off rivals and attract as many females as possible. Clashes can be so violent that the deer can die as a result of their injuries. The Royal Parks’ advice is always to keep a 50-meter distance. If you are taking snaps, use a long lens and consider visiting at off peak times such as dawn on a weekday. Dog walkers are also advised to be cautious and should either walk their dog elsewhere, or make sure they are on a lead and keep to paths and busy areas, where deer are less likely to congregate. Curtis added: “Just because our deer are in enclosed parks does not mean they are domesticated. Our deer are wild and therefore unpredictable. People fail to realise this when they are chasing them with a selfie stick, attempting to feed them or even trying to pet them. Richmond Park and Bushy Park are the two largest of the eight Royal Parks, and together span more than 3,500 acres. They are managed by the Royal Parks charity and are home to nearly a thousand wild red and fallow deer.